Mental illness - mired in controversy? Following Vaughan Bell and John Cromby's 'Head to Head' in the January issue, the discussion continues. 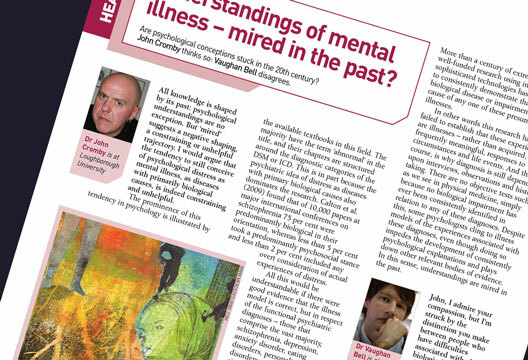 The debate between John Cromby and Vaughan Bell (‘Understandings of mental illness – mired in the past?’, January 2015) produced much consensus but three matters arising stand out: causation; the term ‘illness’; and the relationship between facts and values. Cromby mentions Harré’s ‘enabling and causing’, but it is possible to use a single notion of ‘generative mechanisms’, where causes and meanings coexist in human action and where meanings can become causes. This assumes that we are reflective language-using agents, capable of reproducing or transforming the reality we inhabit, both individually and collectively. However, we are largely unaware of intimate subpersonal (biological) and distal (social) forces, over which we have little, or no, control (Archer, 2000). In other words, we are both determined and determining beings. ‘Illness’ was used differently by Cromby and Bell. In medicine, traditionally ‘disease’ refers to the objectively validated trans-patient features (‘signs’) of pathology, the expert knowledge of which guides good diagnosis and prognosis. For example, in any context a person with a valid diagnosis of ‘Type I diabetes’ will soon die unless the demonstrable failure of their pancreatic cells is compensated for by the injection of insulin. In contrast, hallucinations and unusual ways of speaking are pathognomic in some social contexts but are evidence of extra-ordinary ability in others. Also, a person with a diagnosis of say ‘schizophrenia’ has a highly uncertain prognosis. The empirical and predictive validity of functional psychiatric diagnoses are both very poor. ‘Illness’ traditionally refers to the patient’s subjective experience of pathology, including reported ‘symptoms’ and their biographical impact, which can be highly variable. The rub in this debate is that ‘mental disorders’ were deemed to be so scientifically weak that they failed to appear in official medical nosologies until after the Second World War. Quite quickly the word ‘illness’ dominated (hence ‘mental illness’ not ‘mental disease’). The word matters then in pointing up the particular scientific weakness of psychiatry, as a medical specialty, and the constant and inevitable contestation surrounding classification systems like ICD and DSM. Finally, Bell’s own unchecked assumptions from the naive realist tradition in science become evident, when presuming fact–value separation and when arguing that ‘ethics relates to how we apply knowledge not the knowledge itself’. But evidence does not emerge from an ethically neutral space of social, political and economic processes and interests, awaiting use by a grateful humanity. A relevant example here is the a priori ethical and political stance of Galtonian eugenics. Without that social movement, and the version of science it generated, British psychology would not be where it is today, so too with the current bio-reductionist legacy in ‘psychiatric genetics’, traceable to the Munich group in the 1930s (Pilgrim, 2015; Thomson, 1998). We reap what we sow. Archer, M. (2000). Being human: The problem of human agency. Cambridge: Cambridge University Press. Pilgrim, D. (2015). Understanding mental health: A critical realist exploration. London: Routledge. Thomson, M. (1998). The problem of mental deficiency: Eugenics, democracy, and social policy in Britain, c.1870–1959. Oxford: Oxford University Press. Having read the ‘Head to head’ debate in the January 2015 edition of The Psychologist, I was moved to respond. It seems important to begin by my sharing with the readership that I have spoken and written with John Cromby on a number of occasions. Of course this is not to say that we share the same positions on all topics and indeed we hold our differences. Nevertheless in the service of transparency and in setting the context to what follows this prior relationship is important to acknowledge. John opens by providing a succinct and coherent summary of contemporary understandings as they relate to human distress. He notes, as have others before him, that despite a century of biological research we still have yet to identify the supposed biological causes of what are often labelled as ‘mental illnesses’. Moreover a comprehensive genetic association study completed by Hamilton (2008) found ‘nothing outside of what would be expected by chance’. The work of people such as Read and Gumley (2008) highlights how often the knowledge that the brain that has developed so as to respond to and be altered by the environment in which it develops, is woefully neglected by those researchers focused on ‘discovering’ biological causes. Indeed it has been shown that the brain changes often described as being indicative of ‘schizophrenia’ are also identifiable in the brains of severely traumatised children (Read et al., 2014). Whilst John made reference throughout his responses to the literature, I was somewhat surprised that Vaughn Bell did not, particularly given the tone and strength of the language used in some of his counter assertions. Whilst he disputes how he perceives John Cromby to have spoken about illness, he offers no definition of his own. Comprehending the subtle and not so subtle distinctions between biology and neurology; causing and enabling; and correlation and causation appeared challenging from Vaughn Bell’s responses. The latter I would have assumed as being familiar to most people working in the field. Perhaps less surprising is the appearance of radicalism, which on closer scrutiny appears to reflect the maintenance of ‘business as usual’ (e.g. Boyle, 2013). Perhaps the general public are more radical than they are given credit for, as they are clearly able to understand how adversity in life can lead to experiences of mental distress. I agree that ideological disputes hold the potential to be unconstructive. After all, ideological fixation on the part of this government has given rise to the current social and material environments that many of the public are trying and barely managing to survive in. We know that mental distress is consistently linked with markers of social and material inequality (see Wilkinson & Pickett, 2010; Stuckler & Basu, 2013). And we also know it is not only governments that wish to ignore inconvenient evidence. In view of the above, the writings of David Smail seem ever more apposite: ‘the aim of a social environmentalist psychology…: to help the person achieve “outsight” such that the causes of distress can be demystified and the extent of their own responsibility put into its proper perspective’ (David Smail, 2005). Boyle, M. (2013) Persistence of medicalisation: Is the presentation of alternatives part of the problem? In S. Coles, S. Keenan & B. Diamond (Eds.) Madness contested: Power and practice. Ross-on-Wye: PCCS Books. Hamilton, S. (2008). Schizophrenia candidate genes: Are we really coming up blank? American Journal of Psychiatry, 165(4), 420–423. Read, J., Fosse, R., Moskowitz, A. & Perry, B. (2014). The traumagenic neurodevelopmental model of psychosis revisited. Neuropsychiatry, 4(1), 65–79. Read, J. & Gumley, A. (2008, March). Can attachment theory help explain the relationship between childhood adversity and psychosis? ATTACHMENT: New Directions in Psychotherapy and Relational Psychoanalysis, 2, 1–35. Stuckler, D. & Basu, S. (2013). The body economic: Why austerity kills. London: Allen Lane. Wilkinson, R. & Pickett, K. (2010). The spirit level: Why equality is better for everyone. Harmondsworth: Penguin. Debate between Mr.Cromby and Mr.Bell. We breed many animals for physical strengths, colour etc. but also for temperament. Why, as humans, do we think we are different. Our character/personality depends on our inherited emotions.We do not suffer mental/psychological problems but emotional problems that trigger poor thinking, we are in conflict between our emotions (inherited) and our logical thoughts. I believe that until we get to grips with this as individuals ( psychologists should use this as a base for 'treatment') we shall never be content with life.